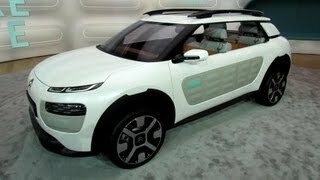 Citroen has revealed the 2013 Cactus concept, a vision for future C-line models, ahead of its public debut at the 2013 Frankfurt Motor Show. 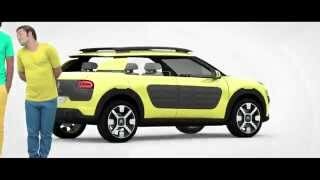 The origins of Citroen Cactus began with the C-Cactus concept car, which premiered at the 2007 Frankfurt show. 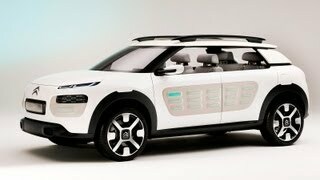 The Cactus is a concept car that marries the essential with the aesthetics. It comes with ‘Airbumps’ which are covered with a soft skin featuring air capsules that can resist to scratches and absorb impacts. The compact hatchback has dimensions of 4.21 m long and 1.75 m wide and has a high ground clearance of 21 cm with an optimized height of just 1.53 m.
The unique, radical design adds to the feel-good factor within the ergonomic and comfortable interior. The instrument cluster is replaced by a 7-inch screen. 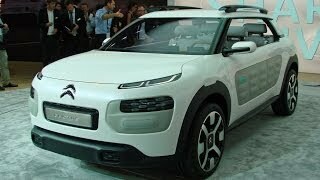 8-inch touchscreen is there for all vehicle functions. The passenger airbag is installed on the ceiling and the push-button controls have taken over the conventional gear stick. 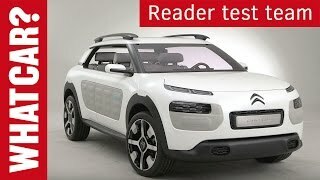 Power comes from Citroen’s revolutionary new Hybrid Air drivetrain– a full-hybrid, compressed air and hydraulics system – which is combined with a PureTech engine to deliver exceptional fuel economy in excess of 94mpg (under 3l/100km). This innovative and highly efficient system, which requires no additional batteries, is widely affordable.